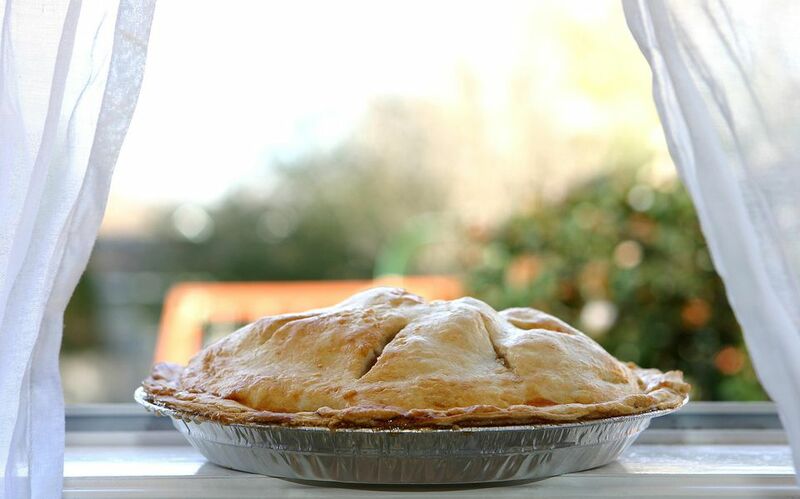 This Granny Smith Apple Pie​ is exactly what you picture when you hear the words "apple pie." The crust is buttery, with a crackly sugar topping, and the filling is full of tart, juicy apples. ​This pie uses Granny Smith apples, because they hold their shape well while baking, are easy to find in grocery stores, and give the filling an unmistakable sweet-tart flavor. If you can't find Granny Smiths, or if you prefer your apple filling to be sweeter, look for apples such as Galas, Pink Ladies, or Honeycrisps. In a large bowl with a wire whisk, stir together the flour and salt. Place the bowl in the refrigerator. Also place the measured shortening in the refrigerator. Measure out the water into a glass measuring cup. Place it in the refrigerator too. Chill all of these for at least an hour. Remove the flour mixture and the shortening from the refrigerator. Cut the shortening into flour either using a pastry blender, two knives in a scissor fashion or a food processor. Add 1/2 cup of cold water. Mix until the mixture forms a ball. If necessary, add more water. If too much water is added add a little flour at a time. Divide the pie pastry in half making two balls. Flour your work surface and the rolling pin. I always like to have a small bowl of flour on the counter in case more flour is needed. Just remember too much flour will make your pie crust pasty tough. Over working the dough will also make it tough. Roll out one ball of pastry at a time, leaving the other in the fridge. Rolling from the middle of the pastry out, make circle 2-inches wider than the inverted pie plate. Roll the dough onto the rolling pin. Unfurl it over the pie plate. The edge should be even with the pie plate rim. Make the pie filling. Place the apple slices into a large bowl. Add the brown sugar, flour, salt, lemon juice, cinnamon and nutmeg. Stir to cover the apples completely with the brown sugar mixture. Pour the apple mixture into the pie shell. Cut the butter into small squares. Scatter them over the apples. Roll the second* dough ball as the first. Lay over top of the apple filling. The top should have a 3/4-inch overhang. Seal the top crust to the bottom crust. Fold under the overhanging dough. Flute the edges as desired. Cut slits into the top to vent steam. Use a pastry brush to paint the top crust with the milk. Sprinkle the sugar over the top. Bake the pie for 15 minutes. Remove it from the oven and cover the outside edge of crust to prevent it from burning. Finish baking the pie for another 25 to 30 more minutes.